Nikola: Tesla’s cabin design is substantially similar to its Nikola One truck. Nikola is currently based in Salt Lake City, Utah, but it’s planning to move its headquarters to Phoenix, Arizona, in July. The patent lawsuit (PDF) was filed in US District Court for the Federal District of Arizona. Nikola is asking for $2 billion in damages. The hydrogen fuel-cell vehicle startup filed design patents on its Class 8 truck in December 2015 and showed off a real-world prototype in December 2016 (you can read Ars’ coverage of that announcement here). Tesla CEO Elon Musk announced in July 2016 that his company was just beginning to build a semi truck. “Tesla never responded,” Nikola claims. The US Patent and Trademark Office granted Nikola Motor Company six design patents between February 2018 and April 2018, protecting the use of the Nikola One’s “wrap windshield, mid-entry door, fuselage, fender, side cladding, and the overall design of a semi,” all of which Nikola says are unique in the trucking industry. The complaint notes that Tesla’s stock price spiked after it announced its Semi in November. “Upon information and belief, Tesla’s market value jumped by roughly $2 billion after the Semi unveiling,” the complaint notes. Tesla’s design has caused confusion among customers. The confusion has diverted sales from Nikola to Tesla. Further, any problems with the Tesla Semi will be attributed to the Nikola One, causing harm to the Nikola brand. For example, Tesla has had problems with its batteries starting fires and its autonomous features causing fatal accidents. Should these problems arise with the Tesla Semi, the market will attribute these problems to Nikola because of the similarities between the two vehicles. Although Autopilot issues seem to have dogged Tesla over the last two years, spontaneous battery fires have been more rare. Neither Nikola nor Tesla has delivered a semi truck to a customer yet. In March, Tesla sent two of its trucks on an inaugural journey from its Sparks, Nevada-based Gigafactory to its Fremont, California-based vehicle manufacturing facility. 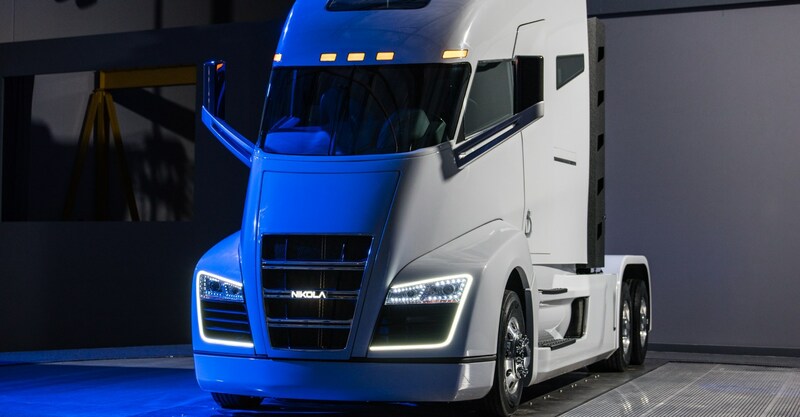 Nikola says it will start delivering its hydrogen fuel-cell trucks in 2021, though initial test models are expected to be road-ready later this year. Nikola has previously said that it would build 360 hydrogen fueling stations in the US. In addition to moving its headquarters to Phoenix, Nikola is building a one-million-square-foot manufacturing facility in Buckeye, Arizona.